. @teddyb_h2o with his 2nd career rushing TD. 1st came on 9/28/14 vs. ATL. #Vikings up 14-0 w/ 14:26 in 1st half. #Vikings now have 17 carries for 108 yards and 1 TD. Now #Vikings are putting Rhodes in slot on 81. Follow today's action with this in-game photo gallery. 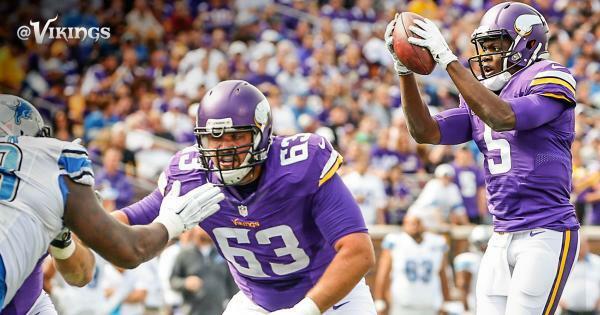 #Vikings DE @Brian_Robison has tipped 2 passes today, 1 shy of his career high vs. TB (10/25/12).
.@teddyb_h2o and the #Vikings will start this drive at their 20-yard line. We don't know what that was, but we liked it! @teddyb_h2o flips to @AdrianPeterson to avoid a sack and Adrian goes for 39 yards! @teddyb_h2o flips to @AdrianPeterson to avoid a sack and Adrian goes for 49 yards! I hate it when AP is foiled by a Mopphead! #Lions moved Ziggy Ansah to rookie T.J. Clemmings side, and he gets the sack on Bridgewater.
.@BlairWalsh3 's 28-yard FG gives the #Vikings a 17-3 lead with 2:32 left in the 1st half. Adrian Peterson has accounted for 119 of the #Vikings ' 199 yards so far. They lead 17-3 w/ 2:32 before halftime. Monroe, Michigan native @Audiesel1 with his 1st special teams stop of the season. DET has the ball second-and-10 from their 45-yard line down 17-3 at the 2-minute warning. 2-minute warning and Vikings up 17-3 on Lions. Peterson has more carries today (16) than he had touches last week (13). 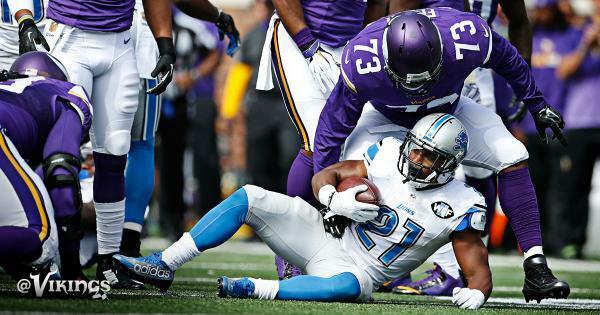 Tell the Lions " no more hurry up offense " it makes the purple D get tired! No one should be surprised that a 30-year-old Peterson did not accelerate and score on reception and that a 25-year-old Peterson would have. Adrian Peterson's touches amounted to just 24 percent of the #Vikings offense last week. That's up to 58 percent in the first half. Don't like that toe drag thing. Who besides ballerinas walk on their **** toes!